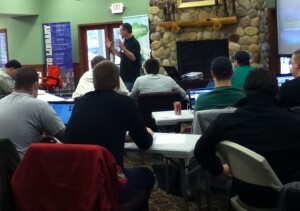 Barry Shafer, author of Unleashing God’s Word, shares with youth pastors at the CE Leadership Summit for Youth Workers. Barry Shafer, author of Unleashing God’s Word, was the keynote speaker for the CE Leadership Summit for Youth Workers this week in Winona Lake, Ind. Shafer is founder and director of InWord Resources. He’s the author of numerous small-group Bible studies and student devotionals and a frequent speaker and trainer at youth worker and student events nationwide. Over the past 20 years, Barry has served in positions ranging from volunteer to full-time youth pastor. He lives in Ohio. Thirty youth pastors and volunteer leaders attended the CE Leadership Summit for Youth Workers held at CE National’s Russell Center, March 6-8.